Microgaming doesn’t really do many officially franchised slot machine games, so when gamers come across one they have done, they are naturally very excited. That is certainly the case with their Battlestar Galactica slot machine. This slot uses real graphics from the series, along with some nicely designed CG icons and symbols. The slot has adopted Microgaming’s customary 243 ways to win feature, and offers two specialised gaming modes for bonus rounds. Any lover of the science fiction television series will feel quite at home playing this TV to slot tie-in. This science fiction themed slot game is a five reeled, 243 ways to win slot, designed and developed by Microgaming, and available in all good online casinos running their software and offering their titles. Coin values in this slot machine vary from £0.01 up to £0.05, and although the paylines are not adjustable, players can place a bet comfortably within the range of the minimum £0.30 and maximum £15.00 wagering limits that the slot offers. As with any typical Microgaming slot machine, there are low paying icons, and as always, these are represented by the high playing card icons. Aside from these symbols, which will be of little interest to the player, gamers can enjoy a good run of wins with the better paying icons, which are made up of characters from the hit television series of the same name, and other CG images such as spaceships and crests. Speaking of spaceships, this icon is the scatter symbol in this video slot. The spaceship offers a free spins bonus round when 3, 4 or 5 of these icons appear anywhere on the reels. A total of 15 free spins will be offered, with a 3x multiplier applied to wins earned during the free spins bonus round. Free spins cannot be retriggered during this round though. Standard scattered payouts are also applied when players have three or more scatter symbols on the reels. Such wins include 1,500 coins for 3 symbols, 3,000 coins for 4 symbols and 15,000 coins for 5 scatter symbols accumulated by the player. The Battlestar Galactica crest or logo is the wild icon. On reel one during normal gameplay, it appears as a staked wild icon. It is also stacked in the free spins bonus round, and it can substitute itself for any symbol, with the exception of the scatter icon. 2 wild icons pays out 40 coins, whilst 3 or 4 icons pay out 400 or 1,000 coins respectively. Finally, 6,000 coins are up for grabs for any player who bags 5 wild icons. Every spin a player makes in this slot will enhance their ranking bar. The more XP (or experience) a player gets the more features they will unlock in the game. There are also three games to run when playing this slot. These include Normal Mode, Run Mode and Fight Mode. These modes can change at any time during play and each offers a different type of bonus and ways to win. During the Run Mode for instance, a timer symbol might appear that turns any high playing card icon into an award winning mystery symbol. When playing in Fight mode, random symbols can be turned into wild icons at any time, and the wild icons are also capable of splitting themselves into even more wild icons. A jackpot worth 1,400,000 coins is available to win in this slot machine game. It is a non-progressive jackpot, and can be won during the free spins with multiplier round. This, however, is one of Microgaming’s more difficult jackpots to win. If you love the television series, then there is absolutely no reason why you won’t adore the slot machine. 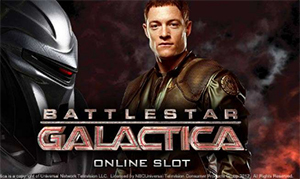 Commander Adama, Doctor Baltar, Lieutenant Thrace, President Roslin are just some of the characters brought into this game, in an attempt by Microgaming to appease fans of the science fiction genre. This slot would do no good after all, if it was filled of fictitious or CG characters not from the TV show. However, a lot of gamers may find this slot, just too similar to many other Microgaming titles, such as Thunderstruck or Immortal Romance. If you have ever played one of those slot machines, you won’t be terribly surprised with the bonus features in this title, considering that they are almost the same thing, just with a different paint job on top. You really have to be a Battlestar Galactica fan in that case!